Our building, as it looked in 1975. Established in 1948, Farnworth Little Theatre is an amateur theatre group situated just outside Bolton. Our first full length play 'Night Must Fall', was presented in 1949, and since then we have offered a continuous programme of up to five full length productions a year. We are totally self-supporting, financing the running and upkeep of the theatre through box office takings, membership fees, charitable donations and regular fund-raising events. The theatre is run by volunteers and therefore offers many opportunities for people of all ages to get involved in a range of activities, from acting to wardrobe, lighting and sound to publicity and set-building. Why not come and meet us on one of our club nights – Thursdays from 8pm? Join us for a drink in the bar and find out more about how our Little Theatre is run. 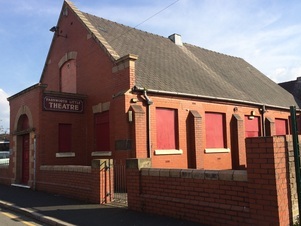 Farnworth Little Theatre is a member of Bolton Amateur Theatre Societies, the Greater Manchester Drama Federation and The Little Theatre Guild of Great Britain.